The NEEK upgrade package is perfectly for users who have Cyclone III FPGA Starter Kit to upgrade their Cyclone III Starter boards into a Nios II Embedded Evaluation Kit, Cyclone III Edition . This kit is a first-class, low-cost evaluation platform for embedded developers. Software developers, especially those new to FPGA design, can install and evaluate the Nios II Embedded Design Suite—a comprehensive software development suite for embedded applications—all at no cost. The included software tutorials and design examples also come with full source code showing applications such as Picture Viewer, Web Server, C-to-Hardware (C2H) acceleration and graphics. 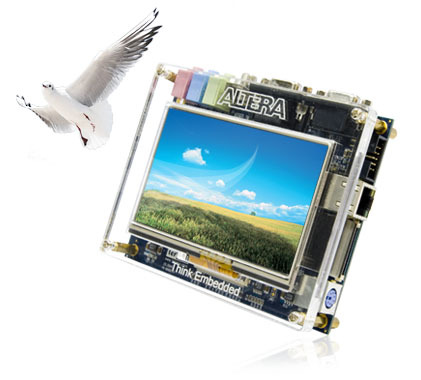 The quality of the NEEK upgrade package is as high as Altera's Nios II Embedded Evaluation Kit, Cyclone III Edition designed and produced by Terasic Technologies. Having the NEEK upgrade package, users are able to connect the LCD multimedia daughter board directly to the Cyclone III FPGA Starter Board without using a cable (Please refer to the picture below).